China has surprised the world when changed its population control policy and has decided to end its 35-year long one child per family rule. It might seem strange that China’s new policy made such a shock when we are in the middle of the third quarter earnings season, the oil price tumble and the European migration crisis but if we take a closer look at it, we understand that this decision project one of the most important problem of the upcoming years. Recently, the Chinese market turbulence and concerns about the slowdown of the economic growth shocked the world economy and drew even more attention to the news about China’s future. This population policy decision affects not only the great power’s economy but might have an impact on the world’s biggest companies. As strange as it might sound, the one-child policy did make sense in that era. 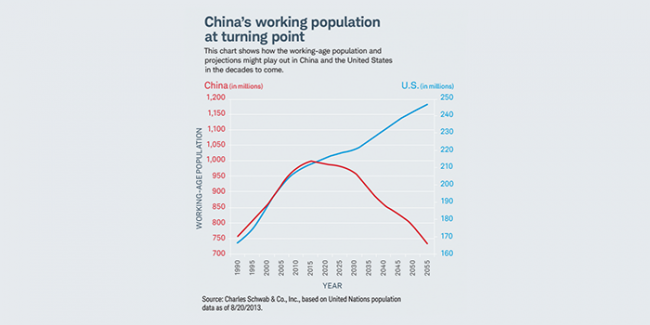 Between 1950 and 1990 China’s population doubled and grew to 1.2 billion. The result of the provision: while in 1980 China’s population was 969 million, this number was 1.35 billion in 2013, shows the UN and the World Bank data. What is important here is the growth rate. While in 1980, it was 1.2%, in 2013 only 0.5% which is less than the United States’ 0.7% and India’s 1.2%. China’s decision allowing families to have two children (this was only possible in special cases before) is related to the fact that China’s economic growth significantly slowed down. In the third quarter, China’s GDP growth was only 6.9%, first time since 6 years that it slipped below 7%. The slowdown probably continues even though China has been the engine of the global economic growth for decades, according to MarketWatch. Looking into the figures, we understand why it is important regarding the population policy. China’s working-age population (ages between 15 and 64) is peaking, which means by the slowdown of the growth, the median of the working-age group is falling. Meanwhile, the rate of the 14 years or younger has also declined which result in a more serious labour market problem. Source: MarketWatchIts impact is obvious: by 2100, China’s population might reduce to one billion from the current 1.4 billion, said Alaistair Chan, Moody’s Analytics economist to the MarketWatch’s journalist before the decision was announced. And a rate like this could cut back China’s growth to 5% until 2030 and push China to the same path as South Korea which is characterised by a quick growth followed by stability while incomes and the GDP per capita is far below the United States’. Moody’s, however, reported that Chinese economy might reach $32.7 trillion of yearly output but it is still far behind the U.S. at $34.4 trillion. The labour market problems would hurt the country even more. 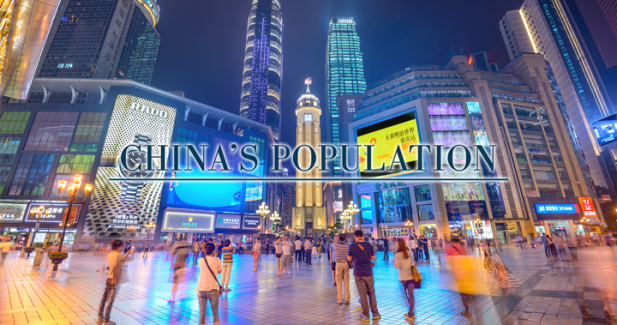 The correlation between the economic and population growth has a special aspect in China. In the most important Chinese cities, real estate prices are extremely high, only a few couples can afford a house for a larger family, underlines Joel Kotkin, professor of Chapman University, California, in his Forbes article. The irony of this is that recently the Chinese real estate boom had a major role in the growth. In addition, China’s main cities have suffered the world’s most rapid growth of property prices relative to income. Last year, the Economist estimated the property price to income ratio of 20 in Shenzen, 17 in Hong Kong and 15 and over in Beijing, even more surprising regarding that these figures are 50-100% higher than super expensive cities like San Francisco, Vancouver or Sydney. This is the reason for China’s biggest cities like Shanghaj or Beijing, having the lowest fertility ratio ever. According to Kotkin, if this trend continues, the government may be lucky if couples have one child. While the first two quarters of this year was mainly affected by the oil price and the strong dollar for the companies, in the third quarter China became the main issue. 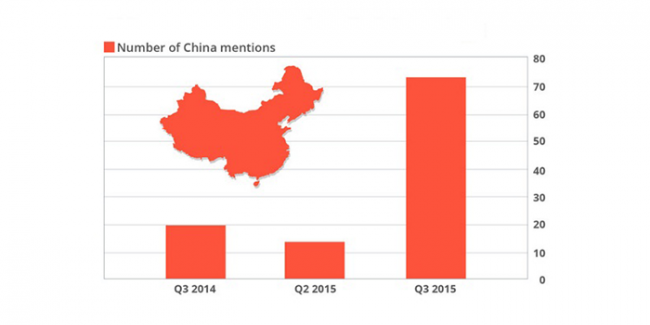 The already mentioned stock market turbulences and the concerns of the growth in the third quarter earnings season, China gets mentions more than 70 times by the U.S., says the MarketWatch, while in the first and second quarter China got around 10-20 mentions. Source: LPL Research, BloombergThe increased attention is only due to the fact that U.S. companies have long engaged with the Chinese economy regarding energy, metals, mining, chemicals, steels and car manufacturing. However, now, a growing number of restaurants, retail, media and diversified technology sectors are also engaged with China and makes more companies (not only in the U.S.) dependent on the shifts in its economic cycle. China is going through a change ad trying to switch from export oriented economy to a consumer-driven society. This, of course, will not happen in a blink of an eye, China has already made huge efforts in recent years but according to certain analysis this can take 20 more years to attain the goal. The end of the one-child policy can be a help of it. The reason behind the change of the population politics is not only related to the economy. As Kotkin highlights, the decision represents a change of opinion regarding the demography. As the last 50 years’ dilemma was the overpopulation, especially in Asia, today, the aging society causes the most problem, even though in sub-Saharan Africa birthrates are above their capacity. In East Asia and in Europe, the main problem is the diminishing workforces, falling birthrates and rapid aging. This is the reason Kotkin draws our attention to China’s brand new decision’s global impact on a significant change regarding the demographic debate.